A sidewalk and curb inventory using ArcPad was undertaken by the City of Seattle, Washington, to fulfill multiple planning and compliance goals. to see how the City completed such a large project, incorporating photos, in under the allotted 6 month time schedule. Alan Girten, Project Manager for Utility Data Contractors, discusses the customization of ArcPad for utility inventory and field inspections. In ArcPad Studio, you can set the layer icon for an AXF layer. It is an easy way for you to make the default UI of ArcPad clearer and meaningful for your field user. The layer icon that you choose will automatically appear in the UI wherever your data is listed (e.g. Add layer dialog, Table of Content). You can find all kinds of icons on the internet or create your own. Sample icons are also included in ArcPad 7.1 samples folder. 4. Select the icon file; click OK to close the dialog. Done! It's now a time honoured tradition for us to participate in the very special VerySpatial Live! Podcasts held each year at the ESRI UC. (Ok.. it's the second time we've particpated). Well done to Eman L. Ramos and the Sweetwater Authority for their 3rd placing in the "Best Software Integration" category in the 2008 ESRI UC Map Gallery for their "Meter Data Collection Project ArcPad Field Application". The map gallery poster is impressive and innovative in how it combines a map presentation with the details of the customised ArcPad application, including script code extracts. This dataset contains the latest streetmap premium dataset from Tele Atlas for Hawaii and Puerto Rico. It can be used with ArcPad 7.1.1 streetmap for geocoding, reserve geocoding and routing. What’s new in ArcPad 7.2? • New geocoding method in StreetMap - This new method uses lookup index to find addresses, which helps to speed up the process of text entry. It now also supports intersection and POI lookup. More documentation about ArcPad 7.2 is available at the ArcPad 7.2 Beta Wiki site. If you have any questions, comments or suggestions, please share with us at the ArcPad 7.2 Beta Forum site. If all of these are 'just too much' for you, then keep an eye on this blog. As well as adding entries on new cool stuff, we will soon be posting bite size chunks of documentation that you may have skimmed over in the above listed documents. 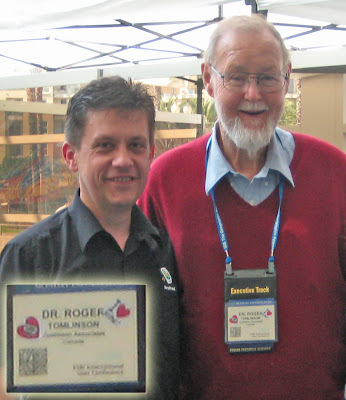 Since Dr. Roger Tomlinson is considered to tbe the "father of GIS", I guess that might make him the "grandfather of mobile GIS". Good thing too, as he also appears to love ArcPad. You will be excited to learn that this new tool in ArcGIS is designed for our ArcPad users! Today I gave it a run. I created a Streetmap readable file for Australia. The dataset was from the 1:250,000 dataset of Australia. It includes Towns, Rivers, Roads, Highways, Urban Areas and Lakes. The dataset as shapefiles was 25Mb and was compressed to 5Mb as SDC format layers using the new ArcGIS tool. An important point is to first set symbology, labeling and scale dependencies in ArcMap and save the MXD file. On the desktop this SDC dataset works well in ArcPad. On the PDA (ArcPad 7.2 Beta Build 32 ) the available memory dropped to 6Mb on loading and held at that level while panning and zooming. Note that the data can only be used as a background dataset as geocoding is not supported with this ArcGIS Tool. This capability is ideal for deploying a multilayered vector data set as a single file where querying and editing is not required. Activating an ArcPad Quick Project over the top enables a rapid start to data capture! Creates a basemap dataset that is optimized and ready for use with ArcGIS Mobile applications. Given a defined extent, the Create Mobile Basemap tool extracts selected vector map layers from an ArcMap map document and converts them into a folder of highly compressed vector data that can then be deployed to mobile devices. In addition, a new ArcMap map document is created that includes only those map layers that were not extracted using the tool. 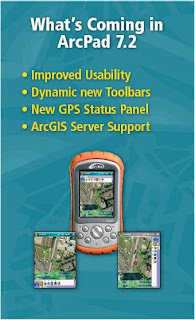 This map document can then be published as a map service with mobile data access capabilities. NOTE: Tool is only available for use with Microsoft Windows operating system. · The input ArcMap map document should contain references to all data layers (operational and basemap) to be used by the mobile device. Operational data refers to data that will be synchronized between a mobile device and a server; basemap data refers to data used for reference/orientation purposes only. The purpose of this tool is to extract and convert basemap data to a format usable by the mobile device. · The tool only supports the conversion of vector data; any raster layers referenced in the input ArcMap map document are not eligible for extraction (see Generate Mobile Service Cache Geoprocessing tool). · Annotation layers are not supported. · The output folder must exist prior to tool execution. · Only data from one data frame can be extracted at a time. If the Data Frame parameter is not used then layers from the active data frame will be extracted. · The spatial reference of the data frame determines the spatial reference for the extracted data (that is the extracted data will be reprojected to the data frames' spatial reference). · The Extract Extent parameter is used to specify an extent by manually entering coordinates or by browsing to an existing dataset from which the dataset extent defines the extract extent. By default, the extract extent coordinate controls are populated with the data frames' full extent coordinates values. · The Extract Boundary parameter can be used to specify a polygon feature class used to clip the input data layers. · If both Extract Extent and Extract Boundary parameters have been specified, the Extract Boundary parameter will supersede. · If no extraction parameter has been specified then all features within the input data layers will be extracted. · By default, if the Layer parameter is not used then all layers within the specified data frame will be extracted. · In instances where multiple feature layers are referencing the same data source, only one output SDC dataset will be created. · Query definitions or selection sets defined on input layers are not respected during feature extraction. · If multiple layers have the same name as a layer specified in the Layer parameter, all layers matching the specified layer name will be extracted. · If a group layer name has been specified in the Layers parameter, all child layers of the specified group layer will be extracted. · Metadata is not modified by this tool. For example, if a clip is implemented during the extraction the geographic extent metadata tags are not updated to reflect the new extent coordinates. · One or more Smart Data Compression (SDC) datasets (.SDC) containing the extracted vector data. · One ArcMap map document containing all non-extracted layers and layer properties from the input map document. Because the map document is not deployed to the mobile device it is written to the parent of the output folder. If all layers from the input map document are extracted then no output map document will be created. · (Optional) One SDC based Network Dataset which has been rebuilt for the extracted area. · (Optional) One or more SDC based Location Services and Address Locators which have been rebuilt for the extracted area. · This tool does not accept any Environment Settings that have been specified. The cool people at VerySpatial are again doing a live show at the ESRI UC this year. Some members of the ArcPad team, desperate to gain media stardom, are again going to be on the show to face a grilling from Sue & Jesse. Join the AVSP live show on Tuesday, 5 August at 5:30 in Room 13 of the SDCC.